©1995 Thomas Cahill (P)1999 Bantam Doubleday Dell Audio Publishing, a Division of Random House, Inc. Yes, the opening chapter or two is on the Roman world, and it's slow. Once you get past that (feel free to skip ahead), it's absolutely fascinating. He gives fascinating information on Ireland, Patrick, the monks who copied all the old books, Irish art, and the unique Irish perspective on life. Worth every penny - once you get past the Roman intro. He does that to give a foundation, but the first time you listen to it, just skip it. Go back later and listen to it. Very well read. You have to get used to the parts where he alters his voice to emphasize characters speaking, but then again, after a few hours even that turns out to be kind of humerous at times and quite enjoyable. This is not a Fodor's guide to Ireland or even a day by day history of Ireland, it's an account of how the Irish monks saved history in written form (among other things.) While the world was burning all the books it could the Irish monastic leaders were collecting all the works of their neighboring world and translating (even transcribing) them for study and posterity. A society that was once nearly illiterate SAVED scores of written works! (Are you not with me here?) 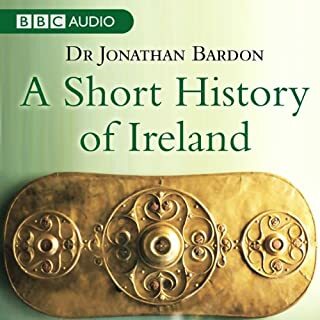 The stories of the Romans, Greeks and barbarians are necessary to understand just how (and why) the Irish managed to save the written texts and thus the history of a great deal of what is now Europe. 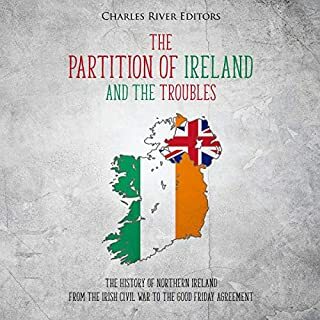 Forget the negative reviews, for they are from people that wanted a history of Ireland and ordered the wrong book. Not just the Irish - the entire medieval history is fair game for this meandering but intelligent and fun author. I listened to it at a faster speed to save time. This is a quick review - interesting content...dreadful delivery. The narration was either very uneven or SOOOO SLOW and PONDEROUS that I quickly drifted off. Buy the book instead, unless you need a sleeping aid (for which I use this recording). From my early school days this part of our history I always found drab and boring. The time of the Tuatha De Danan, St Patrick and the Celts were more about rocks and stones than people, but this book makes a difference. It is filled with fascinating characters, gives an intriguing background to stories such as the Táin Bó Chulainn etc. Donal Donnelly reads it well but sometimes lapses into stage Irish when quoting. Overall a rich and rewarding listen. Highly recommended. 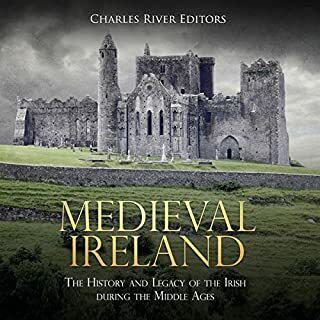 This book is extremely enthusiastic about its topic and does a brilliant job in tracing the great influence that Irish peoples had on medieval Europe and thereby all of civilization. It starts with a long discussion of the collapse of the Roman Empire, then moves to St. Patrick&#8217;s conversion of Ireland. There are many comparisons made between St. Patrick & St. Augustine. It draws out the great differences between the 2 both in idealology &* methodology &#8211; these differences greatly impacting the traditions that followed each. The book also delves into the history of the Celts and their crazy pagan ways. Finally, the second half draws out the main theme. It deals with the way Ireland so quickly became Christianized & literate. Then Irish monks snatched up books from all over Europe whenever the rest of Europe was hitting its lowest point of chaos brought on by the constant Barbarian invasions. Irish monks saved many of our now most precious Latin and Greek ancient texts, recopied them and preserved them. Later, Irish monks re-Christianized much of Britain and continental Europe after much of these peoples had lost touch with civilization. 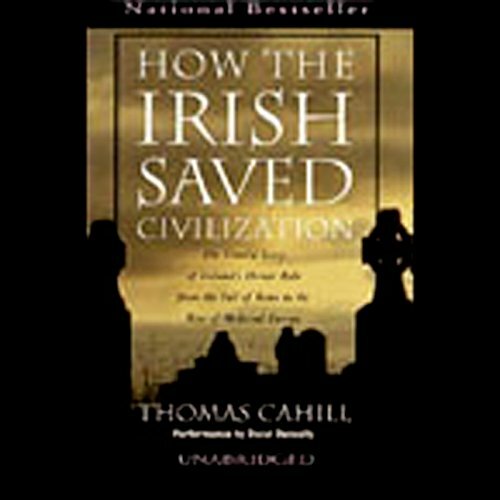 The book is a great intro into the vast impact Ireland had on civilization. The author inserted his own opinions into the book. This was enjoyable & insightful - particularly when he drew out how Irish Catholicism was less unified & more lax on the rules (like the role of women in church leadership). On the other hand, I did not enjoy the fact that the author wrote about Christianity as if it was a tool by which mankind improved itself, but that Christianity in itself is not true any other than any other religion. The author clearly does not believe in any hint of real miracles or real mythology. I found this to be extremely well written with an occasional condecending tone (not sure if it was implied by the reader or from the author, I'd have to listen to those sections again)when expressing a personal observation. The reading was excellent and appropriate to the subject. It may not be the accustomed style, but worked well here. Completely, totally rad, dude!!!! Awesome voices by the narrator. Always fun to hear a history from another perspective! If you expect to learn about the awesome history of the Irish clergy and the early history of the Irish people, try another book. This book seems to be a compilation of the author's lectures which range from Virgil onward. Very disappointing and not worth the time and money. What a shame that this wonderful, fascinating and sometimes moving book was spoiled by the unfortunate timbre and style of the voice of the narrator. The narrative and the stories which make it up, is so strong, that the damaging effect of the narrator's voice was subdued, thank goodness. With a less weary and strained-sounding narration the book would be of a five-star-plus quality, without question. 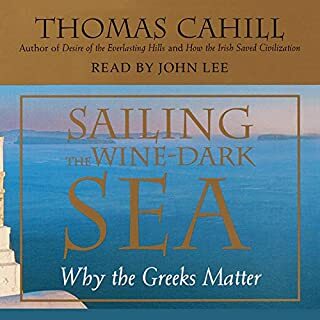 I listened to this immediately after "A Brief History of the Celts", so it was an excellent sequel- a culture once so widespread and powerful, squeezed out of most of Europe (or assimilated), preserved knowledge and literature of the dying and fossilised Greco-Roman hegemony, as the Dark Ages enveloped mainland Europe, but also maintained their own, quirky, lively, adventurous, disputatious customs! It is not general knowledge that the Christianity of most of this big island I live on (Great Britain) springs from Irish sources thanks to the great missionaries (Columba, Aidan, Cuthbert, etc) than to Augustine (of Canterbury) and his boss, Gregory "the Great", arriving rather late in the day to tackle the problem of the pagan Anglo-Saxon colonists. All due respect to Gregory as the first mainland European to even consider evangelisation, and to poor terrified Augustine who would rather stayed at home to wash his hair! Celtic missionaries got about - Columbanus as far as Bobbio (Italy), via France, Brendan to Iceland, Greenland and ?N America. But the victors write the history, (just think how Julius Caesar bad mouthed us Celts) and so in the end, Rome got the credit, as usual- and received wisdom reverted to the old stereotypes of barbaric, brutal, half-witted Celts Caesar promoted and which was far from unusual into the 20th Century. 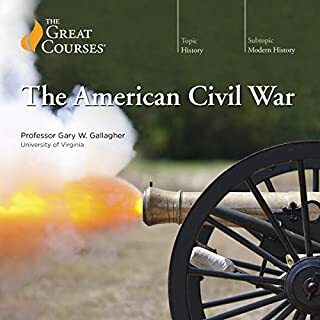 This is without doubt the most disappointing audiobook to which I have yet listened. The title describes the content of just one chapter in reality, ad even then it is an overstated, poorly reinforced assertion. Concentrating heavily on the work of St. Augustine of Hippo and the vicissitudes of the Roman Empire in the early part of the book, the author appears to be interested in presenting a rambling introduction to his views on the weight and significance of the saint's work as well as that of the less-well-known Roman writer Ausonius, engaging in clumsy juxtapositions in the process. 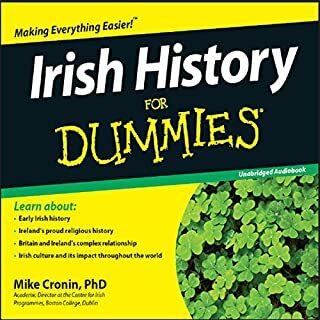 Ireland's entry comes quite late, with poor and excessively windy historical treatments of St. Patrick, the mythological Táin Bó Cuailnge and the movements of Irish saints such as Colmkille and Columba. It becomes apparent that the author isn't sufficiently well acquainted with the subject matter, while his recourse to reprinting long tracts from ancient manuscripts is quite frankly lazy work. The narrator is not bad - his pronunciation of Irish words is poor, yet the monotonous nature of much of the writing does come through in his presentation. Overall quite poor and disappointing. This book is like a trip down memory lane - to being taught by the Christian Brothers in the 1970s. Any difficult aspects of history - such as the fact that were two "Saint Patricks" and not just the one, are either ignored or mentioned only to be dismissed. Most of the book is not even about Ireland or the Irish but St Augustine of Hippo. Don't bother. This was long winded and boring. I am not sure which I detested most the book or the delivery. I found it boring, long winded and a trial of endurance as I made myself listen to the end. really hard going kept waiting for itbto improve but near he end I have given up.